My daughter knows that she has parents and that she could ask either of us for anything she wants. There is no harm in asking. Sometimes we tell her “yes” sometimes “no”, and other times we may say “yes, but not now.” When we tell her that, we are not saying “no” to her requests–however, we are saying that she can have it but not at the present moment. We are not “yes” parents all the time and we do not always give her things when she asks. We assess the situation and then make a decision based on what would be most beneficial for her and us, even if she does not like or understand it at the moment. We see farther than what she can see in front of her. That is how our heavenly father does things too. We tend to get so discouraged when we have been asking for something continuously and have yet to see it come to pass. It has been confirmed by other people, friends, spiritual leaders, and etc that it will come at a later date; yet like the children we are, we continue to ask in different ways in efforts to rush the hand of God. We have the, “It’s my blessing and I need it now!” mentality. I know sometimes I felt like God was teasing me. “Come on Lord, you said it was mines and that I could have it, so why do I have to wait longer to get it?” If it was promised to you and you do not have it yet there are three likely reasons: First, you heard the wrong voice and it was not really promised to you, Second, there is a work within you that needs to be rectified before you can get it and you are not ready, and Lastly, there is some work that needs to be done within someone else, and they are not ready to receive it. Take this example; My daughter loves candy, what kid doesn’t? If she had things her way, she would eat candy all day and no real food. I have a bowl of candy on my table, and whenever she comes in of course that is the first thing she sees. The first thing she asks is, “Mommy, can I have some candy?” [I have mastered the art of saying “no” without saying “no.”] I tell her, “Of course you can have some candy, but not now.” Immediately her head goes down and she starts conjuring up ways to persuade me to give it to her now. “But mommy, I ate all my food at school,” for adults that could be, “But Lord I went to church all last month.” “I even ate my beans mommy.” or “I even went to bible study;” see how it works? lol There is a lesson in every waiting period God has you going through. What got you here, will not get you there. The Bible says in Luke 12:48, “Everyone to whom much was given, of him much will be required, and from him to whom they entrusted much, they will demand the more.“ So even though she ate earlier, which makes me happy, that was earlier. Time has passed in between that meal and now is the time for her to eat more ( digest more Word). God will not give us our candy (Blessings) before nourishing our body with “real food” first- which is the word. I know you’re saying, “I know a lot of people who probably don’t know what a Bible looks like, and they are being blessed.” Keep in mind that the world gives too, God does not give as the world gives [John 14:27] and keep in mind who the prince of this world is. So if you received a “blessing” before having to digest some word, who did it come from? God? or is that something else being disguised as a blessing? Be careful. That very thing you may be calling a blessing could just be “stuff,” and if you are outside of God’s will, it did not come from Him. Things of the world can bring you temporary happiness. Things of God will bring you eternal joy and peace. Know the difference. Now that that’s clarified, a blessing is not really something you want before your season, you just think you do. Kids THINK they want a lot of candy before eating real food. If a parent was to only give the kid a bunch of candy, then try to make them eat food, the kid does not want to, has a stomach ache, sensitive teeth, all kinds of health issues. Then gets sick or has to suffer much pain from a tooth having to be pulled and regret having all that candy in the first place. Some kids will even blame the parents for letting them do something that they knew would hurt them later on. Uh oh! sound familiar? The problem with getting a blessing before your season is that you run the risk of ruining what’s to come next, the abundance, the nourishment. A blessing is just something that ushers you into what God really has for you– abundance, purpose. If you take it out of season that blessing turns into just “stuff.” The thing about “stuff” is that no matter how much of it you have, you’ll always want more, the next big thing. For men, “Stuff” could be just having a woman, a “blessing” is having a wife. For women, “Stuff” is just having a man, a “blessing” is having a husband. Or “stuff” could be just having a job. However, a “Blessing” is having a career. If God said you’ll have that husband or wife He promised but says “not now”, don’t let loneliness have you take matters into your own hands and end up dating without a purpose just so you can have somebody. That person who was meant for you may be watching that foolishness and pass you right on by. If God said it was yours, trust that his Word will not return to him void and If you’re going through Hell during your waiting period, KEEP GOING, keep progressing, move forward! 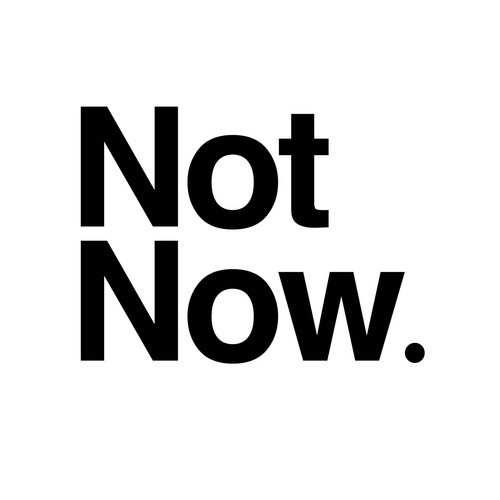 He may not be saying “no,” but “not now.” Pray and fast to find out the reason why. Some things may need to move into place before you get that “Yes.” Be Encouraged and eat REAL FOOD– the Word, and watch God do what he does best, BE GOD!